The problem is not new or limited to the Racha region only. The fact that resources of relatively small wineries are mostly directed towards benefiting bigger wine makers and existence of a limited number of small and family type wine cellars to operate in the region have their own logic. During the recent years abolishment of embargo on Georgian wines in Russia where Khvanchkara enjoys special popularity, was followed by dramatic raise in demand on Aleksandrouli and Mujuretuli grapes. This happened in addition to local climatic problems of the last year. In Racha spring frost, hail and summer drought of 2014 drastically reduced volume of the harvest and resulted in unprecedented increase in the cost of Alexandrouli and Mujuretuli grapes up to 8 Lari (see Aleko Tskitishvili’s article “Record High Prices on Grapes in Racha and Lechkhumi”). Similar to the other regions of Georgia increase of the cost of grapes boosted hopes of farmers from Racha in an unrealistic way. At the moment most of them direct all their resources towards vine growing. However under the circumstances when traditional markets suffer from the impact of economic crisis there is a big chance that this year their expectations turn into a huge frustration. This time we decided to focus on those persons who represent minority in Racha where their vine growing activities are not limited to selling of the grapes only. Despite diverse internal and external complex problems these people have developed a very consistent approach and a long-term vision towards wine business. Some of them are going through the process of being convinced of the advantages of winemaking and make their first steps in the role of the wine cellar owners. Kakha Vakhtangadze’s Family Wine Cellar. Village Jvarisa, Ambrolauri Municipality. 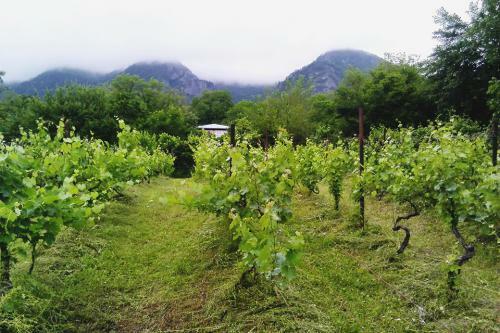 Similar to the rest of the population in Racha, Kakha Vakhtangadze’s family is also involved in traditional vine growing and winemaking activities. His case is quite typical: he sells most of the harvested grapes and uses remaining amount for his own production. Last year he sold 2,5 tons of grapes and made 500 liters of wine. Since 10 years the family started to expand the wine-yard areas and at the moment it already possesses up to 2 hectares of land. An interesting detail: despite the fact that the village is located in the Khvanchkara micro-zone, Kakha Vakhtangadze produces red dry Alexandrouli and Rachuli (Tsulukidze’s) Tetra and successfully sells them on the local market. Kakha Vakhtangadze also produces Saperavi and Tsolikouri sparkling wines for his own consumption. As a result of lack of necessary financial resources needed for development of touristic infrastructure he can only accommodate a small number of tourists in his wine cellar. However he dreams of designing small chateaux, similar to those he saw in Malaga and Kheres. For a long time Kakha Vakhtangadze used contact as well as systemic pesticides in his vineyard (during the vine blossoming period), but later he found out that demand on organic grapes and wine is much higher. For this reason he started to gradually move towards introduction of organic practices. Merab Akhobadze moved from Tbilisi to the village Khvanchkara four years ago. Originally not from Racha he has a very clear vision of his future business and organic winemaking. Merab cultivates almost one hectare of vineyard and last year produced 1,2 tons of Tsulukidze’s Tetra and 500 liters of Khvanchkara. However wine is not bottled yet as he plans to keep it in the vessels for 3-4 years. Merab Akhobadze produces wines from his own grapes only. According to him he would not want to buy raw product that is processed with the use of strong pesticides even if the price on the grapes of high demand was low. His plans include development of touristic services in his wine cellar. However one of the biggest problems in this regard he faces is connected to poor conditions of the infrastructure, namely the local land roads. Case of the Kipiani family cellar is especially interesting as it uses Alexandrouli and Mujuretuli grapes not for production of Khvanchkara but the Kipiani wines. According to the legend in the 19th century Khvanchkara was known under the name of the Kipiani Wine. 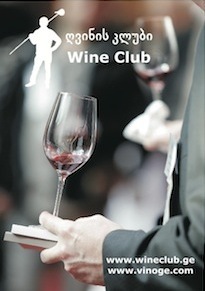 This is a historic detail that is given special value in the Kipiani wine production. Representative of the third generation of the family, Giorgi Kipiani says, that this fact could have been part of a marketing campaign (name of the wine) but actually it has nothing to do with the overall strategy of the company. 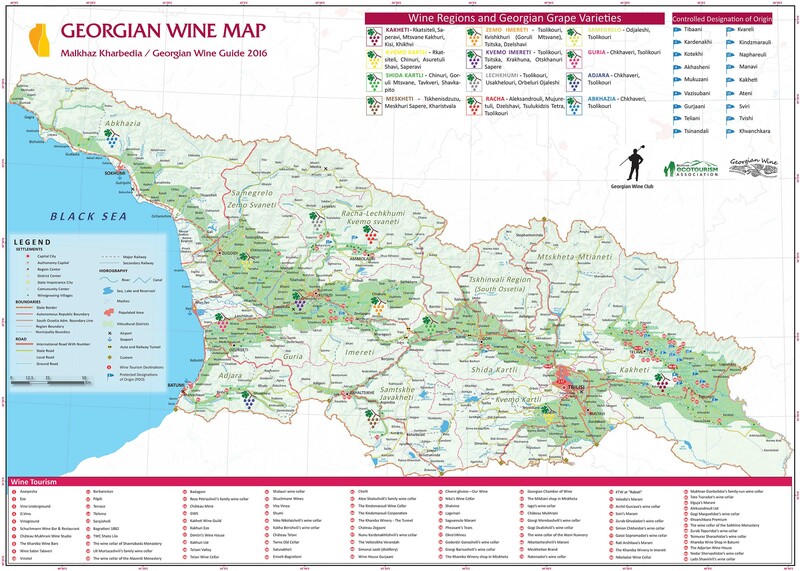 The wine from the Kipiani Wine Cellar is much more than just Khvanchkara that enjoys its demand on traditional markets of the post soviet countries. That is the reason behind an attempt to add to the product a unique new touch. In soviet times Giorgi’s grandfather worked as the director of the Khvanchkara factory. Ever since the family maintains continuous winemaking tradition, which wasn’t interrupted even during the period of economic crisis. At the moment the Kipianis use methods of organic vine growing and winemaking and have already reached certain success in introducing small amounts of wine (340 bottles) to two markets: Japan and the USA. The family plans to extend its business and diversify it through introduction of touristic services and infrastructure.